Your NexStar carrying case is designed to safely carry your NexStar 4/5/6 telescope as well as any Celestron 8" SCT/EdgeHD optical tube. 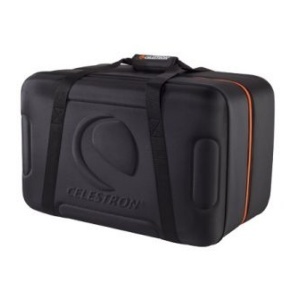 The case is EVA molded to protect your telescope with a hard yet flexible shell. Your case also comes with a convenient storage zipper pocket that holds all your telescope's standard accessories with room to expand. Inside the case includes two dense foam spacers and a built-in compression strap designed to customize the case for each telescope model. The 94003 model includes a durable Nylon handle for easy transportation.